To accompany the publication of our practical guide on “How to do market research” we have prepared a series of blog posts to highlight each of the 7 phases of our market research method. After our latest introductory article we’ll be dealing today with the first phase : testing your idea. We give you a brief overview of these steps below. 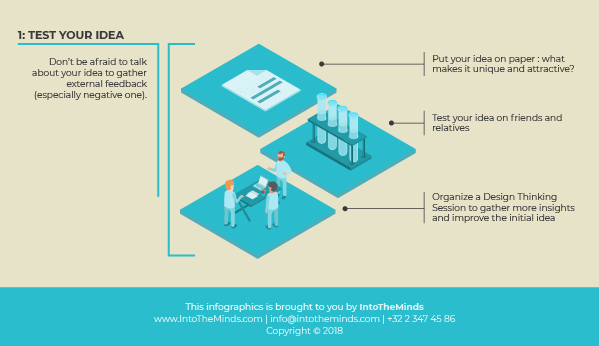 We made “testing your idea” an integral part of our market research methodology because we believe that getting relatives’ feedback is easy to get and can help you avoid mistakes. Entrepreneurs can fell in love with their business idea and become blind to obvious errors that will impede their success. Asking your friends to criticize your idea is a very easy first step to detect the flaws, improve the original concept and come up with a more robust idea. The last step of Phase 1 is to organize a Design Thinking session. Design Thinking can be seen as a collaborative way to gather insights. Using methods to generate idea (“ideation”) and structuring them will enable you to bring your original idea to the next level. We have used Design Thinking in a variety of setting with great success, leading for instance to the creation of a new leather goods brand: Rusée. Who should you start market research at Phase 1 ? Obviously it may not be required to start at Phase 1 in all situations. Some projects may be more advanced and require less exploration. Starting at Phase 1 is in our opinion particularly suitable for first-time entrepreneurs or innovators. Whether you want to sell a revolutionary product or an innovative service, “testing your idea” may help you bring some important improvements and will certainly, through Design Thinking, help you customers’ needs and pains better.